I’m an E70 user, and i wish i could get as much as N95 has in my device (plus amount of free RAM after boot from N76 😉 ). But i’m a qwerty-lover so i’ll stick with E70 for now. I couldn’t agree more with your review of all the wonderful features in the N95. For me, the only thing I would like to change is for a better battery and probably buy a new 8Gb storage card. For all the rest, I would stay with the current N95. Cap, U hit the nail on the head, however i doubt if they’ll ever release a bigger ‘official’ battery for the N95. Don’t see that happening due to marketing issues with the N95 8GB. Chinese variants are available now too, however, i’d stay clear of them definately! I bought and returned two N95s. Both of them made a buzzing sound when the screen is on. A friend returned his because of the many software glitches. I hope the 8GB N95 has better build quality because I still want to replace my N80 with a N95. I’m pleased with my N95. Netherless, multimedia keys are unusable to my opinion and GPS is far too long to fix (even using AGPS) but I can live with that. My *real* concern is about battery life and THAT could drive me to buy a new N95 8Gb: if you need to travel and want to listen to MP3, you’d better dont need to call or be called since you cannot be sure to have enough battery! Ahmad, As far as the buzzing sound is concerned, i’ve faced this issue with my 6681 and a few other phones too. Specially the MotoRazr v3i. Fortunately, this has not bothered me with the N95! But one thing is almost certain, all phones have the sound, some more pronounced! I completely agree about the build quality lacking, the slider i hope is metal rather that the plastic as in the N95 classic. I still entertain thoughts of getting a second battery! and it wld b costlier thn d classic by almost 10k at d time of launch,black wil make it cheap like d n73me.n95 classic, nice name givn bro! shld b recommended! Personally I’m just sticking because of the lens cover. If they add a lens cover to the new one I’m getting it. Khurram, Even i don’t like the shiny black. However a matt finish will be another matter all together! Lol! Whats worse is that in the v12 firmware a long press of the multimedia key doesn’t take us to the music player anymore. It requires two presses and is pretty inconvenient! Should I wait for E90 or just get the N95 now? My network said that E90 won’t be available until october or november but the N95 is already available…. should I wait for the E90 in oct. or nov.? or should I get the N95 now? I’ve heard of horror stories about the E90, some people have been waiting for E90 for a long time (which is like my case) and were disappointed and sold it after a month! There are also a lot of “horror” stories about the N95, I don’t know what to do now! Guys help please! Should I wait for E90 or just get the N95 now? Or is there another or a better choice for a new phone? There are horror stories about every phone but believe me the N95 is the least buggiest phone I have ever had since the Nokia 2100. The E90 is available here for OMR 370, I don’t know how much that would be for you. As for the horror stories you have to try both devices. They cater to different types of people. 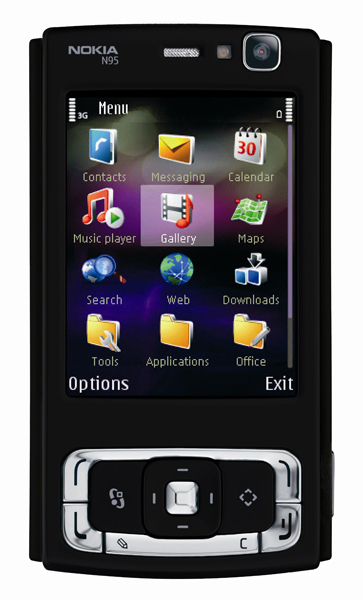 The N95 is a complete multimedia device with a 5 mpix camera and all. The E90 is more of a business type device with a high resolution screen with an aspect ratio suited to working on documents on a mobile device along with a QWERTY keyboard. What you pick is upto your personal style. 5 mpx vs 3.2? QWERTY vs T9? Portrait screen (while typing) vs landscape. Light vs heavy. Stylish vs bulky. Slider vs clamshell? I hope these questions helped you decide. Thanks Jamal, I read somewhere that nokia has stopped E90 production for the moment, maybe this is why our network will not have it until november? A lot of problems I think…. I am coming from an O2 xda mini and I enjoy the functions it has but it is getting outdated already….If the N95 can give me what the O2 mini gives, I have no problems with that! of course the 5mpx camera, gps, 3.5G connection are all pluses….If I get the basic office set up with the N95 I am happy! Jamal , do you think N95 can give me O2 office features? I have an N95 for about 4 months now. I agree with the main comments. My view is forget the GPS – I paid for the voice commands and they are rubbish compared with TomTom. The other problem is just in taking pictures – you take 1 picture then you have to press about 3 buttons to cancel uploads etc before you can take the next one! Why? Tony, half press the shutter button again after taking a photo. Viewfinder will be ready! Maop: I think you should hold out for the E90. The N95 will frustrate you as its not what you want. A Porsche Cayman S and the Mustang have about the same horsepower but one won’t fit the other. The Cayman is a refined sports car that takes turn with insane grip BUT it loses to Mustangs on the straight most of the time which cost a lot less. The glove must fit the hand no matter how nice it looks! How about the N95 8GB? is it available already? I think its coming out in December. I think you better try out an E90 at a retailer. i love my N95 classic….but the N95 8gb is too good to resist . The extra .2 inches , 8gigs , more juice n the black colour make a world of difference …no to mention the revamped icons and UI. maop, The N95 can do office well. Combine it with a bluetoth keyboard and TV out and u’r good to go. The N95 8GB with its slightly bigger screen will be better for on screen editing. Vaibhav, Thanks for the input, I read that quick office for the N95 is just a read only software? Is this true? or do i need to buy the whole software for me to be able to do “office work” like word and excel? or is there freeware available? Yep, u’ll need to buy the editing features. That’ll give you excel, powerpoint and word. Another option is the suite from mobile systems, which also does the same things. However i think quick office is better.